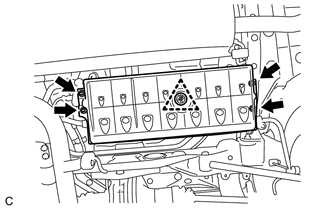 (a) Disengage the 4 nuts and clip, and remove the No. 1 floor under cover. Rotate the clip to disengage it. The 4 nuts will remain attached to the No. 1 floor under cover. (a) Disconnect the vent line tube from the charcoal canister assembly. Do not forcibly bend, twist or turn the vent line tube. Protect the disconnected parts by covering them with plastic bags after disconnecting the vent line tube. 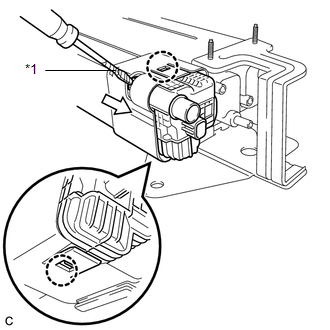 (b) Disconnect the air line tube from the charcoal canister leak detection pump sub-assembly. Do not forcibly bend, twist or turn the air line tube. Protect the disconnected parts by covering them with plastic bags after disconnecting the air line tube. (1) Push the air line tube firmly toward the charcoal canister assembly side. 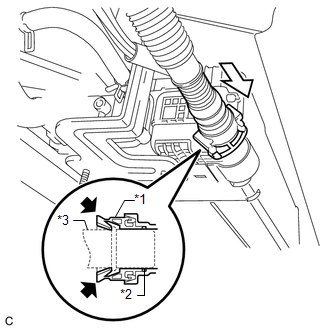 (2) Pinch the tube connector as shown in the illustration. (3) Pull out the air line tube. 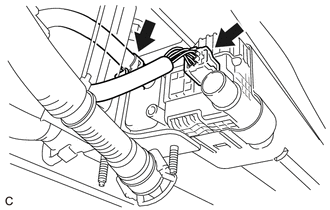 (c) Disconnect the purge line hose from the charcoal canister assembly. (d) Disconnect the connector from the charcoal canister leak detection pump sub-assembly. (e) Remove the 4 nuts. (f) Separate the 2 clips from the body to remove the charcoal canister assembly. 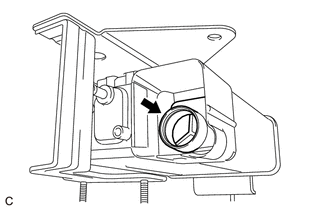 (a) Before removing the charcoal canister leak detection pump sub-assembly, clean the canister by blowing air into it to ensure that the canister is free of foreign matter. 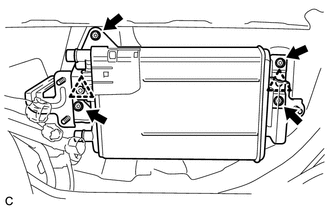 (b) While disengaging the 2 claws as shown in the illustration, push the charcoal canister leak detection pump sub-assembly out using a screwdriver to remove it. (c) Check if the canister contains foreign matter such as mud or water. (1) Visually check that the inside of the canister is free of foreign matter. (2) Hold the canister upside down to make sure that the canister is free of foreign matter. If the canister contains foreign matter, replace the canister.